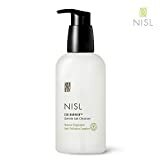 Add Our NISL Eco Barrier Gentle Gel Cleanser to your routine, it gives your skin the natural protective layer and freshness it deserves. This Natural Gel Cleanser uses hypoallergenic that works well even on Sensitive Skin and reduce the fine dust in your Daily Skin Care. Our Facial Cleanser is a best way to start or end your day to help anti-pollution cleaning. For a complete your skincare routine, the dense and mild bubble removes skin wastes. This Gentle Gel Cleanser uses various natural ingredients to make-up cleansing, so you can use make of it as a one-stop cleanser easily at once.